(Bloomberg) -- The S&P 500 is up 16 percent on the year, back to a place where it has twice crashed. 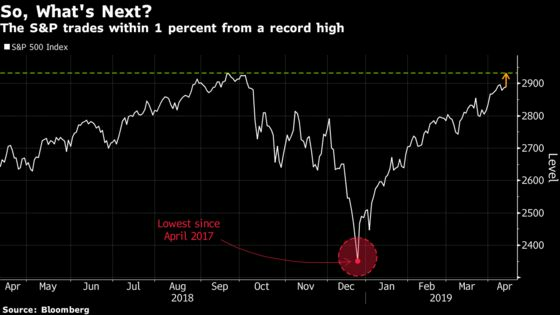 For stock managers who spent the last three months climbing out of their deepest hole in a decade, the temptation now is to take the money and run. The options aren’t new -- buy, sell or hold -- but rarely has the risk of each been so starkly defined. With 71 sessions in the book, the S&P 500 is having its best start in two decades. Central banks are pushing stimulus, spurring comparisons to melt-up years like 1999. 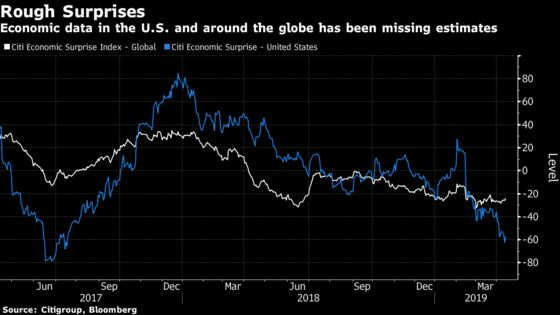 At the same time, earnings are falling, valuations fat, the pace of global growth is slowing and a host of geopolitical nuisances remain unresolved. For investors and analysts with fresh memories of last year’s traumas, it’s a lot to ponder. We spoke to four to see if they’re bailing or buying. 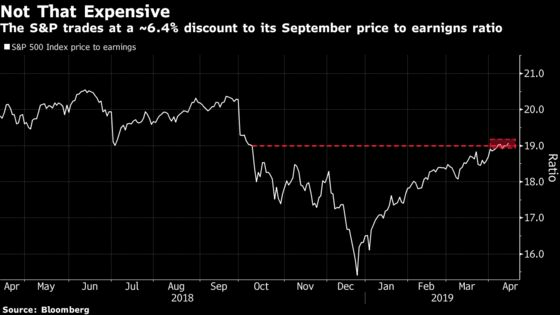 Earnings are the big unknown, with the Wall Street consensus calling for a 4 percent decline in the first quarter and no appreciable rebound until the end of the year. As always, the question for bulls is how seriously to take the forecasts. While brief declines in earnings often beget longer ones, there’s evidence that analysts have started tempering skepticism. They now project 2019 earnings at $166.8 per share, no worse than they did in March or late February. JPMorgan Chase & Co.’s strong results helped send the Dow Jones Industrial Average to its best day in two weeks Friday. How much more juice can be had from extra stimulus? While Federal Reserve Chairman Jerome Powell’s dovish about-face may have transformed sentiment in early January, recent pronouncements by central banks have done less to lift stocks. And while it’s true that 15 weeks of gains have erased last year’s carnage, they’ve also deposited industries in the S&P 500 at or above forward price-earnings thresholds that prevailed before the sell-off. Other gauges also show prices getting frothy. Wall Street strategists are not a group known for restraint, having predicted S&P 500 rallies in each of the last 19 years. Right now, not even they can keep up with the speed of the rally. After climbing for the fourth time in five weeks, the benchmark is 8 points above their average year-end call. Jeremy Siegel, the Wharton School professor who wrote “Stocks for the Long Run,” says that while more gains are possible, at around 19 times trailing earnings stocks are “pretty fully valued.” He’d lighten up on equities if the market were to jump on a headline like the resolution of the China-U.S. trade spat. Should the negotiations fail, on the other hand, and tariffs become permanent, it would be “a big threat to the market, it could go down 20 percent or more,” Siegel said on Bloomberg Television Friday. The combination of a weakening global expansion and strengthening U.S. currency creates even more risk. Then again, risk is never far from the market, while the momentum that has fueled stocks since January is rare. By this time next year, Phil Orlando, chief equity market strategist at Federated Investors Inc., expects stocks to rise a lot more, up 50 percent from last year’s bottom. People who worry about valuations are ignoring an important variable, he says: low inflation and low bond yields, which mean multiples can keep expanding.